Rosemary Essential Oil stimulates Central nervous system and circulation making it beneficial for low blood pressure and low energy and sleeping sickness. Eases asthma and allergies. It improves concentration and memory and keeps you alert on long hours of study and work. Few drops of oil while hair oiling or wash restores dry, flyaway hair and make it shiny may prevent premature baldness. It prevents uterine spasms and menstrual cramps. Item Weight: 10ml; Item Packaging: Cotton Box Ingredients: Rosemary Oil Directions: External ..
Vagad`s Khadi Rosemary Essential Oil has many benefits for hair,body,skin,mind. Rosemary oil is ofte..
Nirvana ROSEMARY Essential Oil 5 mlRosemary Essential oil is produced by steam distillation..
Rosemary Essential Oil: Rosemary oil is one of the most popular essential oils for .. 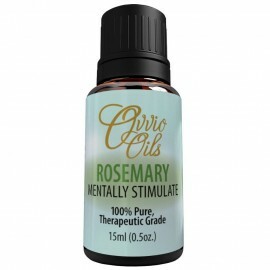 Product Name - Rosemary Essential Oil Fragrance Type - Floral Fragrance Level - .. When it comes to herbs, rosemary is pretty much the queen of them all because of the many health ben..